How can you find more time for prayer when life keeps you on the run? Maybe the answer is easier than you think. 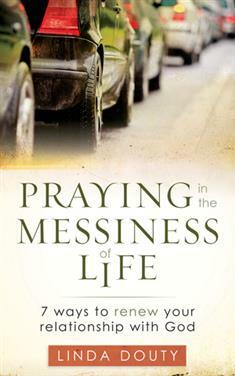 In Praying in the Messiness of Life, Linda Douty encourages you to incorporate prayer into your daily life as it is, rather than trying to find more time to pray. Her fresh ideas for weaving prayer into each day will help you connect with God even in the messiness of life.You will feel closer to God and better able to cope with your circumstances. Spiritual director and author Jane E. Vennard says, "With the words 'God is more interested in our growth than our guilt,' Linda Douty leads us on an exciting journey of learning to pray as we can, not as we can't. Her stories, prayer suggestions, and reflection questions offer heartfelt and practical ways to stretch open our lives of prayer and help us renew and deepen our relationship with God." A great resource for individual or group study. Includes reflection questions and a group guide (with options for a 5- or 9-week study or a prayer retreat).